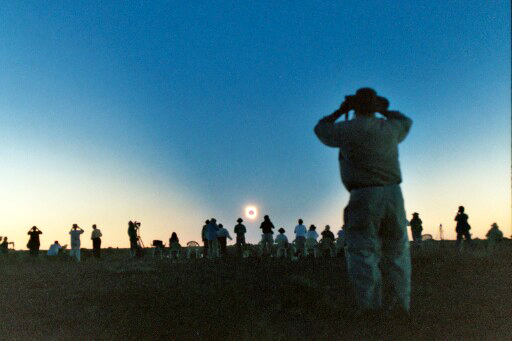 In late 2002, I was given the opportunity to travel as an eclipse specialist and guide to the southern skies with a group of American and British eclipse chasers around Australia. South Australia was to experience a total eclipse of the sun where the moon passes between the earth and the sun blocking a narrow path of light from the sun. 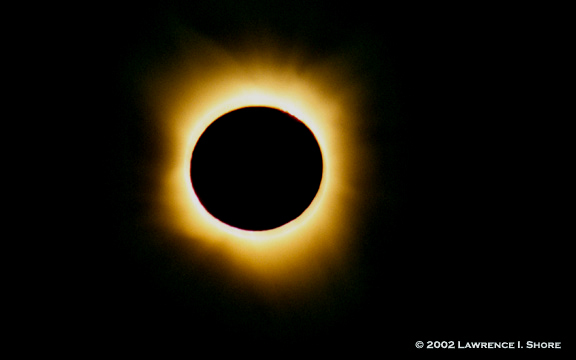 This area is known as the umbra and is the desired location to be to view the eclipse in all its spectacular glory. Our viewing site was located approximately in the area of Mount Hopeless a spot so named by the explorer Edward John Eyre after his fruitless search for an inland sea. The total solar eclipse commenced at approximately 6:43pm South Australian local time and went total at around 7:42pm local time. The path of totality stretched from the coastal town of Ceduna in South Australia across to Lyndhurst and ended near Cameron's Corner when the sun began to set below the horizon. Below are pictures taken of the eclipse and of the expedition by two different photographers. With the sun only a few degrees above the horizon, the sun's corona appeared golden in color. Photo below by Robert Strutz near Mt. Hopeless. Notice the distinct curve of the umbra against the sky.